When he retired in 1914, after nearly three decades as Vassar's president, James Monroe Taylor was hailed as the college's "second Founder," and his contributions are recognized in three campus landmarks, which can all be seen within a five minute walk, starting at the President' House. Our parlor floor included what is now  two of the college's parlors, and the Founder's suite. On the third floor were our bedrooms, and the kitchen was in what is now the comptroller's office [on the ground floor]. These floors were connected by stairways so that we really had a private home separated from the college proper. The doorplates bore the initials "P. H." and when someone asked the meaning of these letters I replied "Poor House, I guess." From that time the President's House never lost that name in our family. 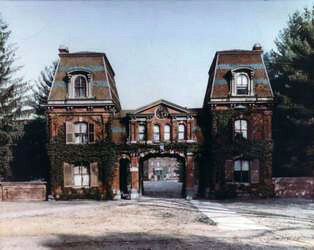 The President's House, 1895, was designed by Rossiter and Wright. 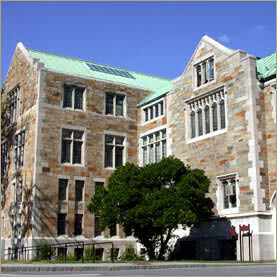 Among his many accomplishment during Taylor's first decade at Vassar was the initation of a faculty housing program which allowed male faculty members and their families to move out of Main. 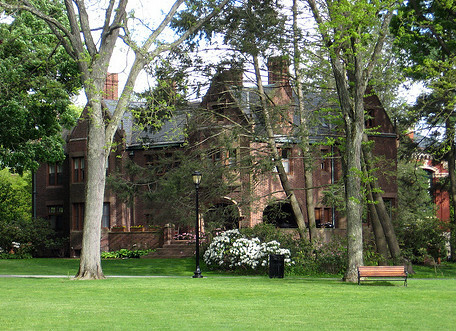 The trustees recognized Taylor first ten years with the President's House, designed by Rossiter and Wright and built with funds bequeathed by the Founder's nephew John Guy Vassar, into which Taylor and his family moved in 1895. In 1904, Taylor's second decade, which had been marked by the building of many of the college's finest buildings, was drawing to a close, and the Chapel was under construction. The trustees once again recognized President Taylor, in one of that building's treasures. 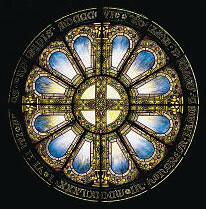 The Rose Window, created by Louis Comfort Tiffany in 1906, is 12 feet in diameter and studded with glass jewels. The graduated white to blue effect in the pear-shaped-portions is achieved not by stain or enamel but by etching layers of the laminated glass. The circular window is located high above the entrance of the chapel, and from the inside one is immediately struck by the brilliant light of the cross, but one might not notice the secular dedication along the circumference of the window: "In honorem James Monroe Taylor + viginti annos praesidis +". The dates 1886-1906 are written in Roman numerals. In February 1913 Taylor announced his intention to retire the following year, and the trustees undertook their most striking testimony to his leadership and accomplishment. 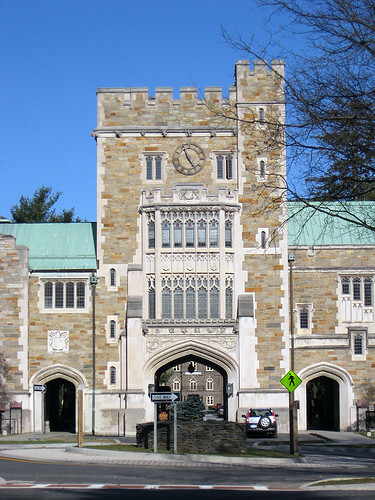 Although it required the demolition of James Renwick's Gate Lodge—an elegant companion and introduction to Renwick's vast Main Building—Taylor Hall, designed by Allen and Collens and opened in 1915, preserved Renwick's original arrangement of pedestrian and vehicular gateways to the college while providing, in the crenelated Gothic revival tower and adjoining hall, space for the Art department's offices, lecture and class rooms, and, originally, its art gallery. James M. Taylor was Vassar's President from 1885 until 1914. President Taylor reflected on Vassar's contributions at the college's 50th anniversary. Cornelia M. Raymond, Memories of a Child of Vassar, Poughkeepsie, NY, 1940. Karen Van Lengen and Lisa Reilly, Vassar: an Architectural Tour, New York, 2004.